Many times over the years have I said that Maitreya was emerging ‘soon’, and thus has this expectation been kept vividly alive in the hearts of millions. That His full emergence has not yet taken place is not a sign of perfidy on My part, but rather a result of the extraordinary nature and difficulty of this enterprise. Men in general know nothing of the laws which govern such an event, nor of the boundaries to Maitreya’s action which these laws create. Also, We, your Elder Brothers, work outside and beyond the notion of time, and find difficulty in placing Our insights and information before men whose understanding is still governed by the ‘fact’ of time. Nevertheless, when all is said, this present ‘time’ should be seen by men as the anteroom in which Maitreya patiently awaits the signal to emerge openly onto the world stage. The present chaotic conditions, especially in the economic and financial fields, have tipped the scales and made possible a decision on a period which men themselves would welcome as ‘soon’. It will not be long, therefore, until the Great Lord begins His open mission, albeit undeclared. Watch and wait with a sure understanding of His priorities, and so miss Him not. How will humanity view this extraordinary man, like none seen in recent memory yet obviously one of us? How will men respond to the simple truth of His utterance? And how quickly will men respond to His analysis of their plight? It is not possible to know precisely how men will react on first experience of Maitreya. The Great Lord will be circumspect and relatively restrained on first appearance, lest He drive away those who need time to evaluate His thoughts and judge their relevance. Soon, however, many We surmise will gather round Him, eager to see adopted the changes He advises. They, in their turn, will stir their brothers and sisters to consider these seminal ideas, and to launch a crusade for sanity in world affairs. These ideas, requiring a complete reconstruction of our present way of life, will gradually appear more logical, more practical and achievable than first they may have seemed, and so a great wave of enthusiasm for sharing and right relationship will sweep across the world. Maitreya, Himself, will potentize these natural stirrings of right thinking among the nations, and will work to foster the growing public yearning for a new direction. Thus will Maitreya work through men to sow the seeds of the New Garden. Thus will He engender in men a longing for the real and the true, for the manifestation of love and justice. In this way does the Great Lord serve humanity, showing them the way to live within the Spiritual Laws. Thus will the Lord of Love reveal Himself to men: as a Brother, a Friend, a Way-shower, a Traveller, like them, on the Way. See Him soon then and rejoice; join His ranks and serve; awaken through Him to your divinity. Q. In Japan education is based on competition. It is heartbreaking, but how should we deal with this as parents? We don’t agree with the schools but we can’t make our children leave school. What can the parents do? A. Become active. Join together and put your point of view before the school authorities. Keep doing this until, bit by bit, changes are made. You have much more power than you think. Q. The nuclear facility for fuel reprocessing in Rokkasho village in Aomori, Japan, will soon open. It will produce the same amount of high-level radiation as one nuclear plant in a year – and the nuclear emissions will go out into the air and sea. Why does humanity keep making these things? How can we stop them? A. Use your power by working together in opposing this infringement of your civil rights. People have enormous power when acting together. Q. Can we stop the struggle between religions – Christianity and Islam, Buddhism and Hinduism? A. Yes! We can stop every violation of our human rights by acting together. Remember, we are all involved in creating this lack of respect for, and intolerance of, differences. Q. Can we request from Lord Maitreya a well or borehole of healing water in South Africa, to heal AIDS victims, fear and poverty? A. There already are healing waters in the area which will be discovered and opened up soon. Q. A few years ago, I came to Friends House in London for the first time, to your lecture. During the meditation I opened my eyes and looked at you. What I saw surprised me. Your face and hair changed shape and you looked like Buddha. The Buddha I saw in films is how you looked, all through the meditation. Mr Creme, are you the 8th degree initiate Buddha you talk about? A. Excuse me, but the idea is laughable! The Buddha is on Shamballa, the highest spiritual centre, in the Gobi Desert. The Being you saw during the meditation was Maitreya. Q. In the book, The Laws of Life, Maitreya says that loneliness is a blessing in disguise for the person is coming close to God. If that’s true, then why is it so painful? I would presume that coming close to God would be a pleasurable thing. A. Maitreya does not mean ‘loneliness’ in the sense of being deprived of friends but rather ‘aloneness’. When we are alone, we go within. When we go within we come closer to God. Q. If we suffer hardships in this life is it because we have done wrongs in our past lives and have not learned from experience? A. Yes, usually but not always. For example, there is general world or group karma to which we are all subject. What we experience as hardship is also relative; to some people it would seem like nearly heaven. Q. If we do not have memories of our past lives and what we did, how are we ever going to evolve as better human beings and help humanity? A. It is a question of experiences and how we handle them. Experience comes to everyone whether we remember or not. Q. Did the scientists who examined the bodies and spacecraft from the Roswell incident in New Mexico, in 1947, keep DNA samples and were they able to analyse and store the chemical constituents of material from the craft and also the clothing worn by the Roswell space people? Does this DNA and other information still exist? A. Yes. They tried to analyze the DNA but the bodies very quickly reverted to the etheric state. The clothing remained, however, and has been examined and stored. Q. Can the space people in the UFOs we see increasingly in our skies ‘hear’ us? Can they telepathically hear that we would like to see them as we stand scanning the night sky? Can we ask them to show themselves to us? I would really like to meet some of our space brothers and sisters! A. Yes, but as often they record reactions of fear. Q. For one of the subjects which I teach to groups of student teachers I ask my students to read, among other things, Krishnamurti’s Education and the Significance of Life (1953), which provides most relevant and practical insights into the essence of right education with regard to the needs of humanity and the world. Without fail, students will complain that Krishnamurti holds very negative views of the world and humankind and that his ideas are not practical or realistic. Some will come around when I point out that his views should be applied to oneself, and that the world has not become a safer place since the Cold War, when it was first published – far from it. The other day I finally realized that perhaps because of their age (typically 22-24 years old), my students just haven’t seen enough of the world yet to see the urgency of his message. Should I perhaps not bother to ask my students to read this book because of their age? Or should I continue to try to sow seeds? Your comments would be much appreciated. A. It takes time and concentration to get close to Krishnamurti’s meaning. Keep presenting it nevertheless, and the light will dawn. These young people will soon hear Maitreya for themselves. He is Krishnamurti’s mentor. Q. Recently, when discussing the need for education to focus on establishing right human relations, I pointed out to a younger colleague that economic values have all but replaced human values in life. To my astonishment he said he wondered if that was necessarily a bad thing, saying that the free market had brought humanity so much freedom – especially in terms of choice in products and services. I was baffled at such apparent ignorance and it left me wondering what, if anything, the Masters would say in response to such remarks? A. They would probably say that these are not bad things to have so long as everyone has the same possibility to have them. On 28 to 29 June 2008 the Transmission Meditation group in Madison, Wisconsin, organized a booth at a Mind Body Spirit fair about the Reappearance of Maitreya. We arrived early on Saturday morning and got the booth all set up. I needed to change my clothes and organize my notes to give a talk about Transmission Meditation later in the morning. I took my backpack, papers and clothes to a bench in the corner of the lobby of the hotel to get myself ready. A man of about 45 years old, wearing a grey t-shirt which had the word ‘Butterfly’ on the logo, came up to me and asked: “So what are you doing?” I told him: “I’m just getting myself organized.” He said: “You get yourself organized, but everything is already in place. The energies are coming in and things are lined up. Like the stars and planets get all lined up … you know … like that.” He put one hand on top of the other indicating alignment and said: “You know what I am talking about don’t you?” I said that yes, I did understand. The man walked into the hotel restaurant and in a few moments walked back out into the lobby of the hotel. I didn’t see him again. Was this encouraging man Maitreya or a Master? In the early 1990s my mother came from Chicago to visit me in New York City. It was in July, timed to coincide with one of Benjamin Creme’s yearly summer lecture tours of the US. I had told her about him and had already attended my first lecture the year before. My mother was curious and agreed to hear him speak at the Hotel Pennsylvania. At the end of his talk, Mr Creme began to raise his hands to give a blessing from Maitreya and Sai Baba. All of a sudden, my mother gasped. I asked her what was the matter, and she informed me that she had just seen “fire” shoot out from one of Benjamin Creme’s palms. I certainly did not see anything out of the ordinary. After we left, we were walking back across town toward my apartment, and when we were about two blocks away near Lexington Avenue, a tall man with dirty blond hair came up to us and asked for a dollar so he could get something to eat. After hearing Mr Creme speak, we couldn’t say no, so I reached into my pocket and handed him one. Then he asked for another dollar. I handed him another one. Then he, again, asked me for another. I said to him: “Hey, right there is a pizza place where I know you can get a slice of pizza for two dollars.” He said thanks, and started to walk towards it. (1) Could that man have been Maitreya or the Master Jesus? (2) What was the “fire” my mother saw? (3) Did anyone else see it? J. P., Chicago, Illinois, USA. 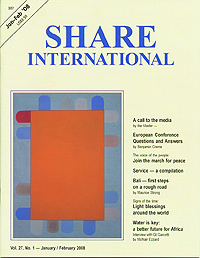 On 23 May 2008 a group of Share Japan co-workers were sitting on a sofa in the lobby of the hotel where the Share Japan Transmission Conference was taking place. It was about 10 minutes before the meeting time. An elegant couple in their 40s or 50s came over and asked if they could sit down. We said: “Please, go ahead.” The man sat comfortably on a chair in the back corner, but the woman sat near us and seemed to be listening to our conversation. Then she got up and approached us and began to talk to us very politely. “What kind of group is Share Japan?”, she asked. “What do you do? You seem to have come quite a distance, from Miyagi and from all over Japan. (We had name tags on us.) You are all housewives, aren’t you?” The woman had short hair, and was wearing a pink-toned blouse and slacks. She was slim and very beautiful. Most of all, she emanated joyfulness and liveliness and asked questions with intelligence and an open heart. I realized that I must tell her the information. I became a bit more relaxed because of her joyful, clear and kind way of talking. She was very interested in us and Share Japan. For a moment, I didn’t know where to begin, whether to tell her our information straightforwardly or not, but finally I was able to muster up enough courage. “The problems of poverty, disasters and the environment are at a critical stage, but actually there is a deep meaning behind these problems,” I said. The woman said: “That’s right. The environmental issues are important. Is your group working on such problems?” I said: “Well, we are a volunteer group who are presenting the hopeful information behind them.” The woman asked: “Is this just for Japan?” I replied: “There are groups all over the world, and the main person who has been delivering this information is Benjamin Creme. He has come to Japan to give talks, and he will also be here at this conference.” “I see, that’s why you are from all over Japan,” the woman said. It was time for the meeting, so we excused ourselves and went into the conference hall. Were this man and woman special people? I was working at the reception desk at Benjamin Creme’s Osaka lecture on 17 May 2008. Around 5 pm when the questions-and-answers session began, just as I was leaving the reception desk, a small man of around 70 with glasses came running in, saying: “I’m late, I’m late!” I had never seen anyone come to the lecture so late. I went into the hall with him and sat next to him in the center row near the front. Mr Creme was explaining Maitreya’s ‘Hand’ card, and the man took notes with an old-fashioned propelling pencil. Then he fell asleep deeply with his head tipped backward. I peeked into his notebook, and it said: “When you are in trouble, you need only to ask, and the help will be given.” As soon as he wrote down those two lines, he went to sleep. I thought it was strange for someone who came so late to fall asleep immediately. Was he a special man? One morning in spring 2008, I woke up in my bedroom and noticed that on the glass of my window were some handprints. I found it very strange, because I hardly touch that window (nor do the other people in my house). It was like the handprints were made during the night. Was this a sign from a Master? Share International regularly prints photographs sent in by readers showing a variety of different light phenomena: light blessings, crosses of light and light images. Typically, a column or swirl of light is discovered on the photograph after development. These patterns of light are not caused by film faults or accidents in the developing process and are only seen on the exposure in question, not the whole film. Benjamin Creme’s Master confirms that they are blessings manifested by Maitreya or the Master Jesus. A further selection of light-blessing photographs follows, chosen from the many sent to Share International. “We have been visited on this planet and the UFO phenomenon is real, though it has been covered up by our governments for a very long time,” said Edgar Mitchell, a former US astronaut who walked on the moon. “I have been deeply involved in certain committees and research programmes with very credible scientists and intelligence people who do know the real inside story and I am not hesitant to talk about it,” he said. England – On 7 July 2008, The Daily Telegraph reported “British UFO sightings at ‘bizarre’ levels” as reports flooded in from across the country. At 9.45pm on Sunday 29 June 2008, in Weston-super-Mare, Somerset, Royal Navy engineer Michael Madden and his colleague Michael Casson were driving home when they saw a “glowing disc” which hovered for three minutes before it “zoomed off”. In Basingstoke, Hampshire, David Osborne reported seeing 12 orange objects for half an hour in the night sky, around 10.40pm, on 28 June 2008. A UFO sighting made front page news in Britain’s biggest tabloid, The Sun, on 25 June 2008, when three soldiers on night patrol at their army base in Shropshire reported seeing 13 unidentified flying objects just after 11pm on Saturday 7 June 2008. Corporal Mark Proctor filmed one of the objects on his mobile phone and reported the sighting to Army officials. “They were like rotating cubes with multiple colours,” he said. Another soldier said: “There were about 30 lights passing over for a few minutes, very high but not at great speed. They were bright red.” Three hours later, the same night about 80 miles away in Cardiff, South Wales, helicopter police reported seeing a huge craft. Some time after that a couple reported seeing a strange light in the sky over the A5 road, near Shrewsbury. Requests for Freedom of Information access to government UFO archives have resulted in local media showing a renewed interested in sightings in their own areas. The following is a selection published by the Cardiff News of just some of the sightings in Wales recorded by the Ministry of Defence and UFO websites in South Wales, UK, from 2004 to 2007. 2004: – Barry, September: A bright, star-like object, shaped like a box-kite, flying silently at 2,000 to 3,000 feet towards Cardiff Airport – which later said it had no corresponding visual or radar report. – Cardiff, October: An extremely large craft, gliding noiselessly thousands of feet up across the sky above a busy road just west of the city. At least 16 drivers got out of their cars to watch. 2005: – Cardiff, February: A bright blue object flying above the city at about 9.50am which broke into three or four segments before disappearing. – Cardiff; Tyla Garw, Pontyclun, July: Two UFOs seen by a woman who emphasized that she was “not mad”, that she was well aware of what she had seen and “the two UFOs were not planes”. A further sighting was reported over the city in the same month, and a further two in a nearby village. 2006: – Gwaelod-y-garth, March: A cigar-shaped object (or 40 lights flying in a cigar-shaped formation), witnessed for about 30 minutes as it travelled at great speed down the Garth Mountain, its lights alternately disappearing and reappearing. – Cardiff, April: Dancing lights in the sky at 11.45pm, one of which suddenly moved off in a different direction to be joined by two more orange coloured, but slightly less distinct lights, which danced around each other before disappearing. Dr Prabhavati Dwabha is the director of Ramana’s Garden Home for Destitute Children, part of a small grassroots development project called “Say Yes Now!” that she founded 16 years ago. “Say Yes Now!” is dedicated to empowering poor women and children who live in the remote mountain villages of northern India’s Garhwal region in Uttarkhand state. Dr Dwabha, a homoeopath by training, was living an affluent life as an American actress before embarking upon a spiritual journey that profoundly changed her life. Prabhavati Dwabha describes her spiritual awakening and the work of Ramana’s Garden in an interview with Jason Francis for Share International. Share International: What is Ramana’s Garden Home for Destitute Children and what are some of the projects it is involved in? Prabhavati Dwabha: Ramana’s Garden is a home for the 67 children who are living here. We also offer education of the highest standard absolutely free to ‘untouchable’ children who come in from the village. The only prerequisite is that they are from the lowest social class in the village. They receive free books, meals, school uniforms, warm winter clothing, and all the medical care, including emergency treatment, within reason, for their families. The project is set up so that the children who attend the school, and certainly those who live here, will, with this quality of education, be able to make a difference for themselves and their families. It’s our way of combating the caste system. For an ‘untouchable’ child it is impossible to have the opportunity for an education like this. Therefore, they very seldom get out of the caste system. But with the education that’s being offered here we can be sure they will go on to professions – doctors, nurses, teachers, electricians. We’ll have our first student starting medical school in July . SI: What is the caste system in India? PD: The caste system in India was developed hundreds of years ago. When it was set up, it was thought it would be the most practical way to manage a society – someone had to be the sweepers, someone had to be the cleaners of the waste of other people. Someone had to be the teachers, the priests, the law officers and someone had to be the lowest, which are the ‘untouchables’. The caste system was supposedly abolished but it’s still going on. SI: What is the daily curriculum for the children who attend your schools? PD: It varies depending upon the season. Right now they are starting at 8am because the days are getting very hot. They arrive at the compound at 7.30am and play in the playgrounds until 8am. They assemble and sing prayers for 20 minutes and then go to their classes. The daily curriculum is the standard “three r’s” – reading, writing, and arithmetic – as well as environment, science and ecology. They have a state-of-the-art computer training center and there are art classes, classical Indian dance, music, composition, and sometimes theater. At 2pm they have a meal of organically grown vegetables from our gardens and then they return home. SI: What is the background of the children who are helped by Ramana’s Garden? PD: For them to live in Ramana’s Garden they have either no parents or a justifiable reason why they couldn’t remain with a single parent. A drunk and abusive father would be a reason, especially if he was involved in the mother’s death. A widow with absolutely no way to support her children would be another reason. We also have a number of refugees who came to us after the guerilla war in Nepal and who have lost their families. And we rescue girls sold into prostitution, before they actually get used in brothels. All the children in the home are from a severely traumatic background. SI: How are the overall mindset, self-esteem and self-image of the children being changed? PD: We notice a huge change. The kids empower themselves mainly through their creativity. We have a dance troupe that danced at Anand Himalaya Spa Resort, which was recently rated number one in the world. They present cultural programs every week. The dance troupe has been invited to tour England by Butlins Resorts this summer, to make cultural presentations for their resort chain. That’s very confidence-building and it creates a lot of self-esteem. The children who live in Ramana’s Garden make all their own clothes and clothes for the poor children. As part of our vocational training we run our own bakery and organic café and the children actually serve the customers in the café. The children also have their own gift shop where they make jewelry and sell it. These things are very empowering. Once they recognize their self-worth, they come to an understanding that whatever happened to them in the past has given them the strength and courage to be where they are now. They begin to see what a tremendous advantage they have. SI: Could you describe your concept of an inner, rather than material, abundance and why you feel that type of abundance is important? PD: For the children it’s essential because no one can know what the future will be. No one can know when something could take the walls down around us and send the children back into the street. There’s nothing that I can give them on a material level that can ever give them true security, any more than I could say that if we had millions in the bank, which we certainly don’t, that would give us true security. The only thing that’s going to give myself, the children, or anyone for that matter, security is when they understand that it isn’t about what they have on the outside. It’s about knowing who they really are. It’s about having inner gratitude. If they have trust in who they really are and their self-worth, that can’t be taken away from them even if the outer world collapses around them. If you have a rich, comfortable life you fear losing that. You have a lot more attachments. The kids came from nothing. Some of them literally came right out of the gutter. They know that they survived there. We try to make them understand that their misfortune was a divine gift. I believe that you learn what you live. Through living they’ve had the opportunity to see the darkest of the dark. That will give them eyes to appreciate the life they’re living now. Not to fear that they might return to the dark, but to understand what they have within them can never be taken away. We are very happy if we have walls around us, a bed to sleep in, and lots of food to eat, but our being, our true happiness, isn’t going to depend on that. Life gives us plenty of opportunities to understand and experience that when we really don’t have enough money to run this project, when money gets very tight, I see the kids make do with what they have. I don’t see anyone being depressed about it. We had a really meagre Christmas where we had almost no presents, and everybody made cards and recycled things. There was so much gratitude for what little we had, that we were together, that we were able to have anything at all. The United Nations Organisation has formulated a code of human rights which, if implemented, would go far to resolve the existing social tensions, and to provide the basis for a just and stable society. So far, this Universal Declaration of Human Rights remains but a dream for millions of dispossessed and disfranchised people in every country in the world. The aim must be to establish, with all possible speed, these basic rights in all nations. What is the solution to the massive upheavals and tragedies taking place all over the world? Just as the politicians sent huge armies to defend the 4-5 million people of Kuwait to protect its non-existent democracy, so they should send armies to Africa where millions upon millions of people are suffering. Their suffering is a direct result of the mischievous politics of African politicians who have been given arms and ammunition by the West and the Soviet Union. Where are the Europeans, the Americans and the Soviets now? Not in Africa or the Third World, because these areas have nothing to offer in oil or revenue. They call themselves the defenders of democracy and peace. But Maitreya calls them the Pretenders. They do nothing because there is nothing in it for them. It is not God who causes such calamities. The blame should be pinned firmly upon the politicians. The General Assembly is the true United Nations. The Security Council has passed the peak of its value and should be unwound; it no longer has any real function. Russia cannot speak for the whole of what was the Soviet Union, and there is no reason at all why five nations, five permanent members, should dictate the political/economic norms of the world. The Security Council has to go, and as soon as the Security Council goes the United Nations Assembly will find its proper voice. We are about to witness profound changes in all our institutions and structures – political and economic, religious and social, scientific, educational and cultural. These changes will take place as humanity grasps, stage by stage, its essential Oneness, and adopts the measures necessary to implement that Oneness…. When we have accepted the principle of sharing (which principle will be forced on the governments by world public opinion), each country will be asked to make over, in trust for the world, that which it has in excess of its needs. Every country will be invited to make an inventory of its assets and needs. Fed into computers, these statistics will provide a United Nations Agency, set up for the purpose, with the information on which a rational redistribution of the world’s resources can take place. In this way a better balance between the developed and underdeveloped world can be achieved. It has been estimated that the redistribution programme will take two to three years to implement. The plans and blueprints for the scheme, drawn up by high initiates – economists, financiers and industrialists of great achievement – have long been in existence, awaiting only the demand of humanity for their implementation. A sophisticated form of barter will replace the present economic systems…. The key to a more harmonious political climate is the acceptance of the principle of sharing. Both the democratic and the communistic systems are in process of transition, and as they evolve they will become less mutually exclusive than they now appear to be. Greater world harmony will result. When the newly formed United Nations adopted the Universal Declaration of Human Rights on 10 December 1948, it set a milestone in international relations. Now, as the 60th anniversary of the signing approaches, a campaign has been mounted to publicize the Declaration, and to gather worldwide public support to pressurize governments into putting its aims into practice. – The right to freedom of expression. Individuals can sign the Declaration on the campaign website, and are encouraged to invite friends, relations and colleagues to do likewise. The massed signatures will demonstrate the determination of the world’s people to live by the Declaration’s principles, and will further empower the Elders in their work to have those tenets embraced by governments worldwide. The Universal Declaration of Human Rights was adopted by the United Nations on 10 December 1948 and is sixty years old in December 2008. It was one of the first major achievements of the United Nations and it continues to have an enormous effect on people’s lives around the world. Drawn up shortly after the end of the Second World War, the Declaration represents a common statement of goals and aspirations for a peaceful and just world. Now translated into 200 languages it remains one of the best known and most often cited human rights documents in the world. The drafting process took two years to complete with a committee composed of eight people, from Australia, Chile, China, France, Lebanon, the Union of Soviet Socialist Republics, the United Kingdom and the United States of America. Despite some conflicting views, they agreed to include in the document the principles of non-discrimination, civil and political rights, and social and economic rights and agreed that the Declaration had to be universal. On 10 December 1948, at the Palais de Chaillot in Paris, France, the 58 Member States of the United Nations General Assembly adopted the Universal Declaration of Human Rights. The Assembly proclaimed it as a “common standard of achievement for all peoples and all nations”, towards which individuals and societies should “strive by progressive measures, national and international, to secure their universal and effective recognition and observance”. Although the Declaration is not a legally binding document, it has inspired more than 60 human rights instruments which together constitute an international standard of human rights, including the International Covenant on Economic, Social and Cultural Rights and the International Covenant on Civil and Political Rights, both of which are legally binding treaties. Together with the Universal Declaration, they constitute the International Bill of Rights. The Declaration recognizes that the “inherent dignity of all members of the human family is the foundation of freedom, justice and peace in the world” and is linked to the recognition of fundamental rights towards which every human being aspires, namely the right to life, liberty and security of person; the right to an adequate standard of living; the right to seek and to enjoy in other countries asylum from persecution; the right to own property; the right to freedom of opinion and expression; the right to education, freedom of thought, conscience and religion; and the right to freedom from torture and degrading treatment, among others. These are inherent rights to be enjoyed by all human beings of the global village – men, women and children, as well as by any group of society, disadvantaged or not – and not “gifts” to be withdrawn, withheld or granted at someone’s whim or will. Mary Robinson, who became the second United Nations High Commissioner for Human Rights in September 1997, believes that: “human rights belong to people, human rights are about people on the ground and their rights”. The missing link in fighting extreme poverty? Once again, a G8 summit has failed to address the structural causes of poverty. While the [July] 2008 conference of the world’s rich nations on Japan’s Hokkaido Island made a modest pledge to increase aid and investment in agriculture, the bulk of their economic proposals were the familiar nostrums of free trade and open markets. One would think that a successful strategy for ending global poverty would have been found long ago. After all, there has been a strong commitment since the era of decolonization (1940s-60s) that the best way to help poor nations participate on equal terms in the global marketplace is for their people to become self-reliant. Yet the means of accomplishing self-reliant development have never been entirely clear. During the past several decades, the international system has lurched from policies of nationalism and import substitution to strategies of privatization and export-led development. Nothing has really worked. Even the green revolution of the 1960s – which increased agricultural productivity and food supplies while lowering foods prices in the newly developing nations – ended up supporting the laissez-faire orthodoxy and systemic neglect of the poor, so clearly exemplified by successive G8 summits. Over the past four decades, agricultural investment has stagnated and agricultural productivity has gradually decreased in poor nations, while developed nations continue to sing cheery anthems of aid, trade and investment each summer. The bare truth is that Western development policies have left many of the poor without property protection through legal titles and little opportunity to invest in land or to open a business. Neo-liberal policies have also led to the exploitation of local workers through the absence of employment benefits, shabby working conditions and insecure jobs. As the global population grows to 9 billion or more by 2050, agricultural production will need to increase by 50 per cent. We won’t get there safely from here without an entirely new strategy on global hunger and development. A new UN panel has recently issued a report focusing on a much-neglected aspect in the fight against extreme poverty. The report of the Commission on Legal Empowerment of the Poor, Making the Law Work for Everyone, calls for the creation of a new legal identity for impoverished people. Co-chaired by Madeleine Albright and Hernando de Soto, and comprised of analysts, jurists, and former government officials from across the world, the panel asserts that the poor must be guaranteed essential legal rights to realize their full potentials for development. The commission, which undertook consultations in 22 countries, is calling for greater access to judicial systems, new worker protections, property ownership rights, business rights and the rule of law. It believes that particular emphasis must be given to the rights of women, indigenous peoples and other vulnerable groups. The underlying philosophy is that, given the chance, poor people will work to get out of poverty. Legal empowerment can boost human potential, responsibility and opportunity, allowing people to get the most value for their work, leading to greater self-reliance, individual and social development, and new business initiatives. 850 million people are suffering now from extreme hunger. With ongoing climate change and higher food prices, the number could swell to more than 1 billion within a decade, resulting in social upheaval and civil strife in many areas. At the same time, legal empowerment of the poor could help bolster the world’s commitments to the UN Millennium Development Goals – the targets for international development which have been set for 2015. Many states have fallen far behind in the realization of these goals, particularly in sub-Saharan Africa, and the 2008 G8 Summit in Japan offered few promises to further their 2005 commitments to double aid to Africa by 2010. Yet for the 2 billion people who are earning less than $2 a day, the attainment of legal rights may be the surest way of helping them realize their development targets. Title to land, land tenure and basic rights of ownership, along with microfinance, can enable small farmers to establish a plot, buy fertilizer, seeds, tools and technology, and secure better access to water, roads, transportation and market information. It is evident that the legal protection of the poor has never been given due attention, so this new emphasis is most welcome. For the world community to renew its focus on the supporting legal conditions of human and social development, everyone must get involved in this new mass initiative, including representatives from government, business, and civil society. The legal empowerment of the poor will only be possible through political commitment, firm leadership and concerted effort. At a time when virtually all nations are gripped by shrinking credit, balance of payments deficits, and soaring oil and food prices, it is especially important that rich nations show courage and leadership in providing a legal safety net for the impoverished. That would be an auspicious step forward. The world’s favourite statesman, Nelson Mandela, recently celebrated his 90th birthday. His message to his countrymen, and to the world, was simple – the rich must help the poor – share with the poor. He talked of how fortunate he is to have lived so long but as usual he was thinking of others: “If you are poor, you are not likely to live long,” he said. More than 100 Israeli academicians and peace activists have signed a declaration and sent out a press release voicing their concerns about alleged Israeli plans to attack Iran. The group called Ad Hoc Group Against Israeli Attack on Iran states that there is “no military, political or moral justification to initiate war with Iran”. The academics and activists say there is sufficient information indicating, “that the Israeli government is seriously considering attacking Iran, in order to disrupt its nuclear plans”. The Ad Hoc group is opposed to the use and development of atomic weapons in principle and it supports the elimination of all weapons of mass destruction from the region. The group points out that the main source of tension, which could escalate into further conflict and war, is Israeli government policy and “the flow of threats from it, backed by provocative military manoeuvres”. I would like to offer my greetings to the People’s Republic of China, the organizers and the athletes participating in the forthcoming Olympic Games in Beijing. Right from the time of China’s application to hold the Olympic Games, I have supported China’s right to host the Games. This is a moment of great pride to the 1.3 billion Chinese people. These Games should contribute to promoting the Olympic spirit of friendship, openness and peace. I send my prayers and good wishes for the success of this event.